In 1870, Vienna’s legendary Musikverein opened to the public with two concerts. The first, in the Great Hall, was orchestral; the second, in the chamber music hall, starred Clara Schumann on the piano, as well as several other guests. Clara Schumann was playing a new piano made by the J.B. Streicher & Sons studio. This piano, in fact. 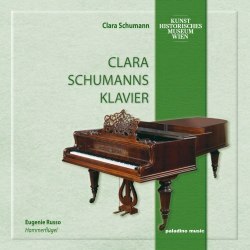 Paladino’s Historical Instruments series reaches a high point with that same piano used for an hour-long recital of Clara Schumann’s own compositions. They’re so appealing already that the added historical interest - and the considerable warmth of the instrument itself - are icing on the cake. In spirit Ms. Schumann was unsurprisingly similar to her husband, but I suppose without the added inspiration and audacity that mental illness can supply. There are whiffs of Mendelssohn in the plainspoken melodies of the Sonata in G minor, a dabble of Chopin in the wonderful Nocturne Op. 6 No. 2, and strong hints of Robert in the three Romances, which are more varied and deeper than their name implies. The first of the three could easily have been a late Brahms intermezzo, honestly. The Souvenir de Vienne is built around the Austrian national anthem composed by Haydn (now mostly remembered as “Deutschland über Alles”). Pianist Eugenie Russo has kept a low profile on disc but she’s taught piano in Vienna for decades. Her playing here is expressive and well matched to the instrument. There’s a full set of Clara Schumann’s piano music on CPO, taking up three CDs. That set kind of sounds like a period piano, but only because it’s a modern piano with idiosyncratic sound engineering - I think. For a varied, skilfully played recital on a period instrument, this will be hard to beat. As with the rest of this series, there are extensive notes on, and photos of, the instrument featured. Unlike a few other instalments I’ve encountered, the musical importance far outstrips the value to historical instrument junkies. It should appeal to everybody.